Congratulations to Donovan for winning one of the top awards at the BT Young Scientist for River-Nanny– Analysis and Monitoring River Ecosystems -Balancing Drinking Water Use with Natural Environment in a Changing Climate. This is a monitoring system that will be installed along the River Varty and currently is being considered for a LEADER grant. Wonderful news! The River Vartry Protection Society has been accepted for a project from the National Strategy for Angling Development Fund. The Ashford Weir has been in a lack of repair since January 2016 and with no champion to look after it. We all know that the fish are better off without the Weir but it has left an ugly scar on the River Vartry. Without action and without any future because of the size of the project, we decided to have a practical plan to divide the project into two parts. 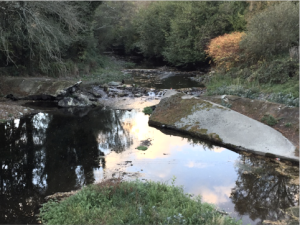 The first part is to get the Wicklow County Council to fund removal of the existing concrete and to level and grade the river base according to a Design and Implementation Plan made by the Inland Fisheries Ireland. The work will be undertaken by the WCC but YOU NEED TO CONTACT YOUR LOCAL COUNCILLOR TO GET THE MONEY FROM THE 2018 BUDGET! Wicklow County Council are agreeable to do the work, IFI are agreeable to advise and only we need to “press” our Local Representives to get Phase 1 complete. The grant is for Phase 2, which will be an Architectural Contest to design an Ashford Waterscape that will eventually be voted for by the public and be constructed here at the Ashford Bridge. At the same time we will remove Japanese Knotweed, trim the overhanging branches and generally clean up the area where the Weir once stood. This is to enhance the habitat of the Salmon and angling potential of the River Vartry. We are so pleased for this opportunity given by the National Strategy for Angling Development Fund 2017 to the River Vartry. Irish Water kindly provided us with the River Vartry Dam Survey conducted the 2nd of October 2013 which is the basis for some of the remedial work planned in the new Water Treatment Plant. We would like to give credit where credit is due and appreciate what Ned Fleming does for all of us by his diligence in protecting and keeping the Dam safe. 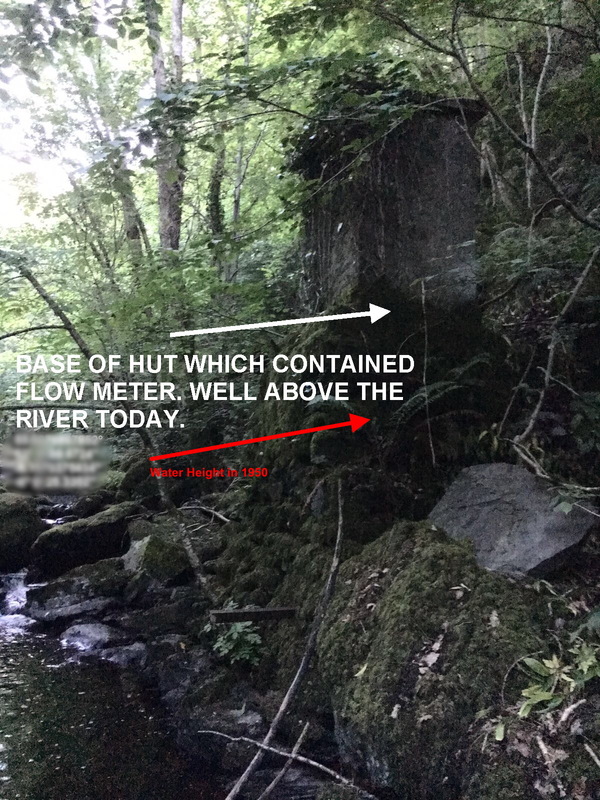 The report in general reflects this care and gives a good bill of health for a Dam that is mud and clay, constructed in 1865. 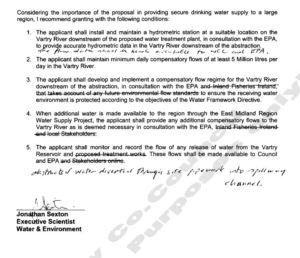 As a Category A Dam (where a breach could endanger lives in the community), the small suggestions are mostly part of the WTP’s normal maintenance program and the more long term remedies are part of the plan and urgency needed for the new WTP. We are still concerned over the process to re-grade the Slipway and that it will not put any stress on the Dam. We would prefer that there was an EIA and some public supervision over this critical phase of the new development as we are all located below it. 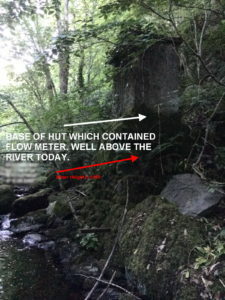 As well, we need to see that the rock removal does not put ANY mud, silt or other discharge into the river itself. 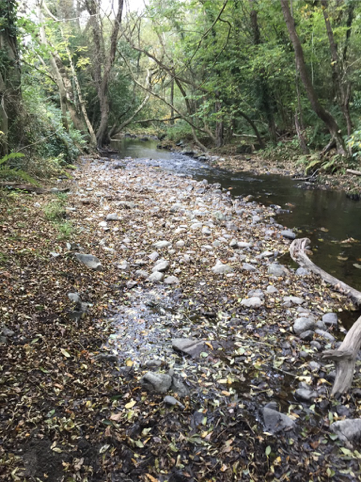 Thank you again for providing this document as this is the kind of cooperation we hope for in the future so that we can all enjoy the benefits of the River Vartry, both for it’s natural environment and it’s benefit to Dublin as a water resource. We have the Oral Hearing on June 12th, 13th and 14th at the Glenview Hotel, Glen of the Downs (if it takes the full 3 days). 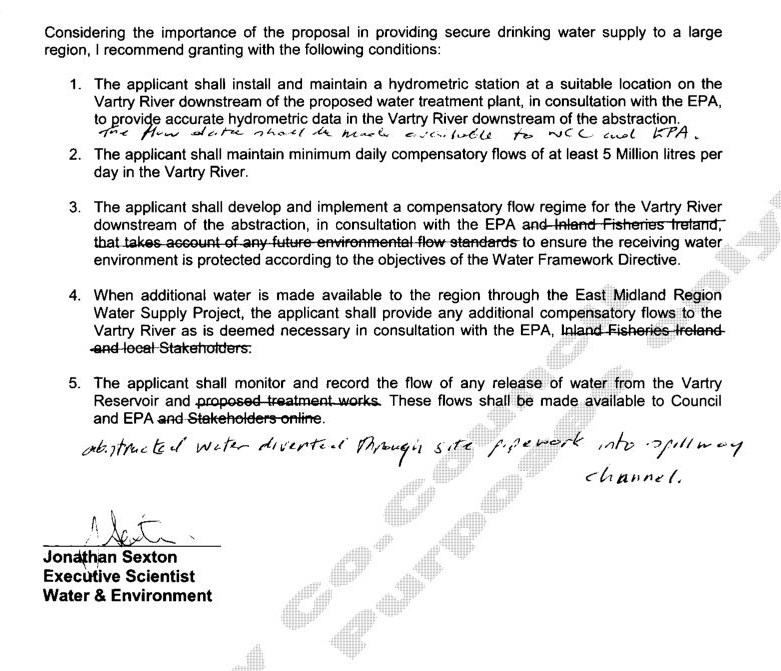 This is very important that we have support on the days to see Irish Water do right by the River Vartry. We know people work and for many it will be hard to take time off, but even if you can only drop in one of the days, it would be some support. We will be there from 11:00 to 17:00 on the 12th, 9:30 – 17:00 on the 13th and 14th. We are as prepared as we can be and are very hopeful that An Bord Pleanála will see it our way and send Irish Water back to Wicklow County Council for a full independent EIA. We have a few surprises for them, so don’t miss it. We want to see the NEW, (not UPGRADED as Irish Water prefer to call it), Water Treatment Plant is built, but want proper care taken of the environment, the river and the salmon. We hope to screen a short film of the River, never before seen, of huge salmon in vast numbers coming up the river for the spawn. It show how important our Mighty Little River Vartry is to the EU, Ireland and ourselves and the importance for us to build a State of the Art WTP showing that in Ireland we take care of our environment, not destroy it.